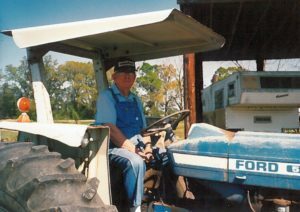 Sundown Farms – A farmer works in acres not hours. This site shares the country home of Tom and Mary Davis. It also hopes to be a tribute to the farm and life of Tom’s father and Mary’s adopted father, Artis Ray Davis. This website is managed by Tom and the posts are intended to be a personal log of progress, weather, animals, and a database of info useful in the management and maintenance of this special piece of God’s paradise. An additional purpose is to share the farm life of Grandpa and Grandma (i.e. us) with our grandkids. The posts they likely will find most interesting are found by clicking the tag “Grandkids”. 2019 is our first full year living here and getting to see the changes of the seasons every day is amazing. The mild winter giving way to a wonderful spring and the many separate “leafing outs” that occurred, reminds one that the whole world is a garden. What farming is about…the Farmer’s work ethic. The Best Days for Progress in 2019 per the Old Farmers Almanac. All things we undertake shall contain integrity, compassion, elegance, and grace.